toilet paper roll, sheet card stock, 1 pipe cleaner, 7 medium popcicle sticks, paint/markers/crayons to colour sticks if not coloured, pencil, white glue and scissors. Line up the 7 sticks and draw line across middle with pencil and then cut them in half. Start gluing each to tube until you meet again and adjust spacing if need be as you get close to meeting first stick. Cut the pipe cleaner in half and bend like a handle. Glue to inside of basket. For the Chick we used a large pompom and medium pompom with two small white ones for eyes. A marker was used to make eyes and cut the beak from some card stock. Glue small pompom onto larger one then glue two little ones as eyes. Stick a feather through the back and glue beak on. Now you have a chick and a basket! Another quick project if you have some extra toilet tubes is a bunny stamp. You'll need two rolls of tp tube or one paper towel roll cut 3 even pieces. You need to squeeze two of the pieces to resemble the ears then glue to circular piece to form a bunny silhouette. Once the glue is dried you can proceed to use as stamp. Just get yourself a solid piece of paper and decide what colour(s) your stamps will be. Dip in paint and press on paper. You can get your child to finish the scenery with paint or with any other medium. Or there is a post on ideas for Easter Scavenger Hunt. 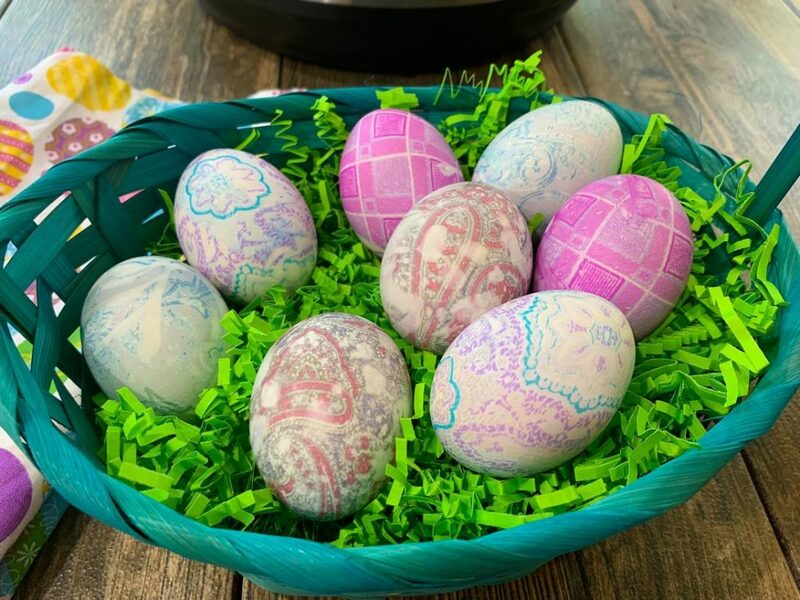 There is also some great egg decorate from other blogs like This Ole Mom's beautiful instant pot eggs. Or these super cute Nightmare Before Christmas Eggs and if that isn't enough Eggsperation then try 50 Ideas For Amazing Easter Egg Decorating or if you are really talented especially with a crochet needle check out these adorable Lambs you can make with free design.